Japanese food lovers in Singapore should be quite familiar with Teppei Japanese Restaurant @ Orchid Hotel (Tanjong Pagar) that is popular for its value-for-money omakase set dinners (require 6 months advance reservation) and bara chirashi dons. But what I really like is their takeaway counter, Teppei Syokudo, which is conveniently located at places including Takashimaya Food Hall, ION Orchard, Republic Plaza, Millenia Walk & more. No need to make reservation or wait too long – you can pack the Kaisendon back to your office or home to enjoy whenever you want. Best of all, prices are very reasonable for these superbly fresh sashimi on rice. 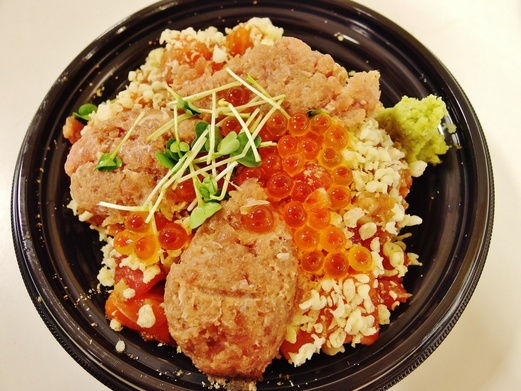 My usual order of the regular Kaisendon (S$16) with extra topping of Negitoro or chopped tuna belly (S$8). 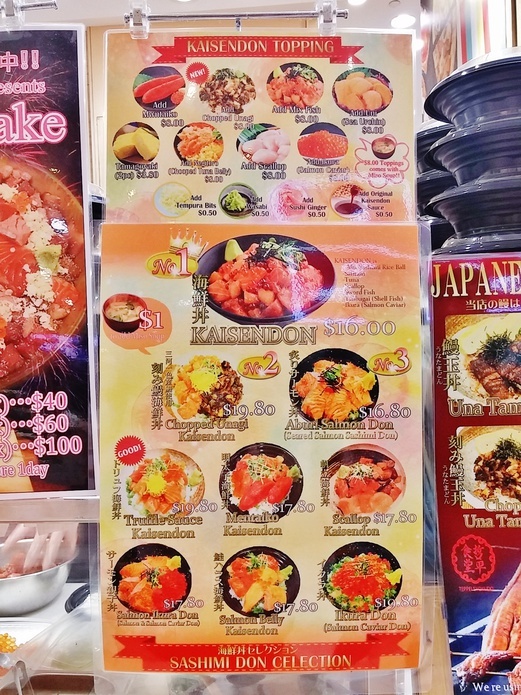 The Kaisendon itself came with a generous amount of salmon, tuna, sword fish, scallop, whelk and salmon roe. There were so much ingredients on top, I couldn’t even see the rice at the bottom. Not complaining though, haha! 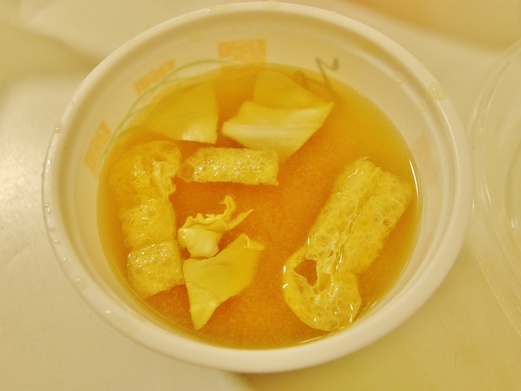 The raw seafood were marinated in a salty sauce which was likely soy-based. It would be nice if the sauce was made just a tad less salty so I could taste more of the natural sweetness of the sashimi but I guess they were more heavy-handed because the steamed rice below was plain with no flavour so it really needed that piquancy to come through. What I loved most about the Kaisendon was how big and chunky each piece of sashimi was. Nothing was sinewy and everything just tasted so fresh and succulent. 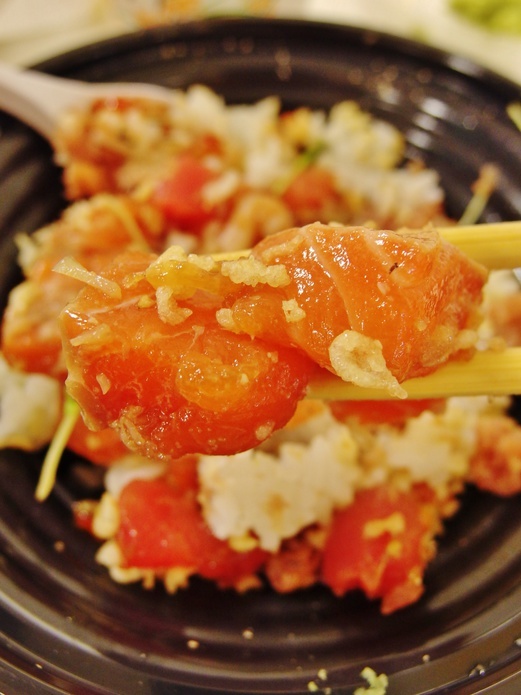 The extra serving of chopped tuna belly merely added on a layer of luxury with its melt-in-the-mouth texture and the salmon roe would just explode in the mouth. Not forgetting the crunchy tempura bits and freshly grated wasabi that really gave a nice kick. A bowl of deliciousness indeed. So good. Miso soup costs an extra S$1 but if you add on a S$8 topping like what I did, the miso soup would be given at no extra charge. It looked like a humble serving of soup but it was a very enjoyable miso soup as it was packed with flavour without being overly salty. And it made a good palate cleanser when you need to wash away that salty taste of the seafood marinade. 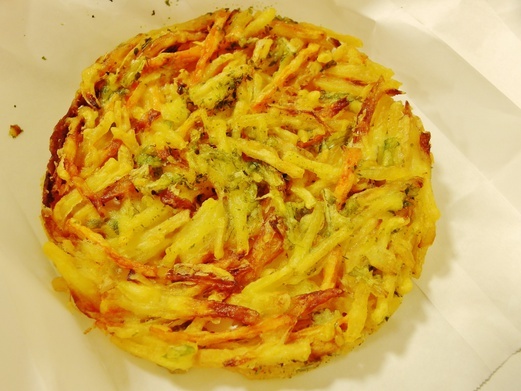 The Big Fry Vegetable (S$3.90) was a huge block of deep-fried vegetable tempura that was quite crispy on the outside but as it was left out for a while, it was no longer warm and it oozed oil when I bit into it. Pity because it was still quite tasty – just needed a little bit more seasoning (or perhaps a dipping sauce) as it was on the bland side. Still worth getting next time if it’s from a freshly fried batch. Craving for sashimi? You know where to go now. 🙂 My mouth is just watering as I’m writing this post. Need to go get this again tonight!